• PLOT SUMMARY: Cover by Patrick Gleason. Prelude to The Blackest Night - Emerald Eclipse: Part 5 of 6 - Written by Peter J. Tomasi. Art by Patrick Gleason and Rebecca Buchman. The penultimate 'Emerald Eclipse' chapter is upon us as the breakout on Oa leads to vast devastation and death across the planet. 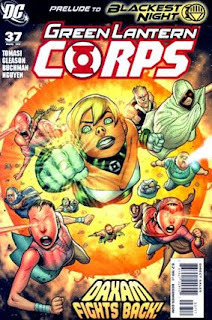 As the War of Light rages, do Kyle Rayner, Guy Gardner, Kilowog and the rest of the Corps have the willpower to quell the riot and overcome the napalm-spewing Red Lanterns and the fear-spreading Sinestro Corps?